Most of us Americans have heard of Bergerac thanks to the fictional character with the big nose, Cyrano, created by Edmond Rostand in 1897. Indeed, the town adopted this fictional character as their own and erected a statue to him. I suppose civic statues of fictional characters are not uncommon in human culture, but it still seems a bit crass to me. 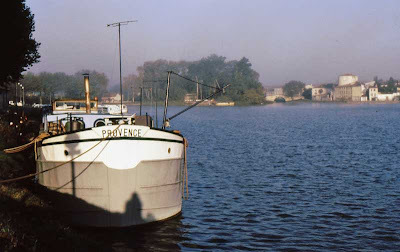 The banks of the sleepy Dordogne at Bergerac. We only spent the night in Bergerac and walked around town a bit in the evening and the next morning. It's very charming, and was very quiet when we were there. It might have been the Toussaint holiday or even a Sunday, which would explain the lack of activity. 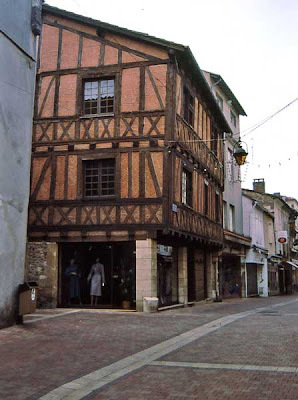 Restored buildings in central Bergerac show off their timber framing called colombages. The center of town has been restored into a nice pedestrian district filled with colombages, those medieval buildings with large timber structures showing in their façades. The city is built on the right bank of the Dordogne river and is home to about 26,000 Bergeracois. After breakfast and checking out of the hotel, we headed west again. 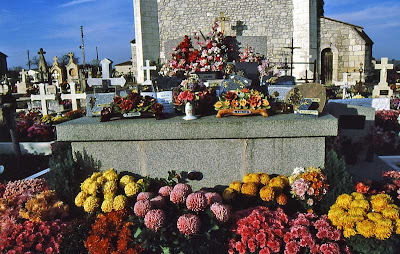 We passed through a small town whose churchyard cemetery was decked out with chrysanthemums as is the custom on All Saints Day. 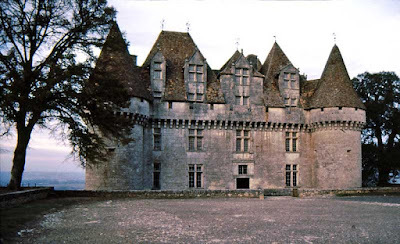 Our morning's destination had another literary connection : the château of Michel de Montaigne, one of France's most influential Renaissance writers. Chrysanthemums set out in memory of the dearly departed. 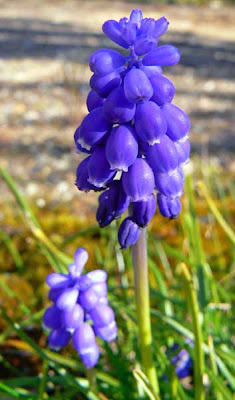 Muscari, or grape hyacinth, pops up in a few places in the yard this time of year. The flowers are very small, but when there are many of them clustered together, you see kind of a purple patch in the grass. I've dug up some of the bulbs and transplanted them to other parts of yard quite successfully. 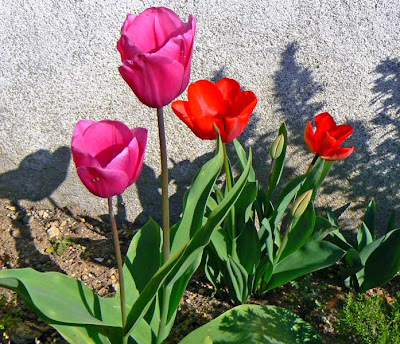 The tulips are in bloom as well. They're not as prolific this year as they have been in past years, so I think I'm going to dig them up and divide and relocated them to another place later on. On Wednesday we had a great sunny day with temperatures in the low 60s. Since there was very little wind, we decided it would be a good day to burn. I keep tree prunings and other non-compostable yard waste in a "burn pile" out back. It's covered with a tarp to keep it dry. Then we pick a day in fall or spring to light it up and watch it burn. 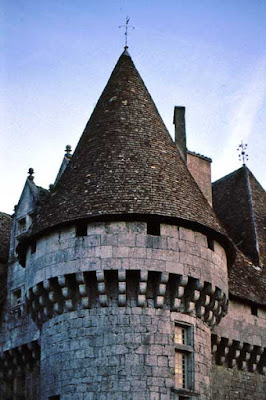 Just south of Bergerac, on the heights above the left bank of the Dordogne river, sits the Château de Monbazillac, a mid-16th century construction that straddles the architectural styles of the middle ages and the Renaissance. The castle is owned by the Monbazillac wine cooperative, and vines cover the valley slopes. The Château de Monbazillac sits above the Dordogne valley near Bergerac. Three grapes are grown here that combine to make the sweet white vin de Monbazillac : sémillon, sauvignon, and muscadelle. Monbazillac is an A.O.C. 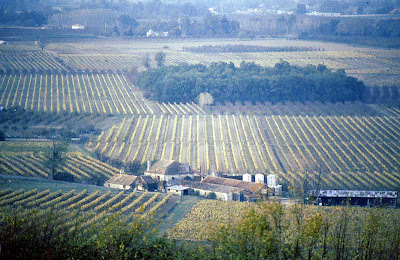 in its own right (since 1936), and is most often compared favorably to Sauternes. 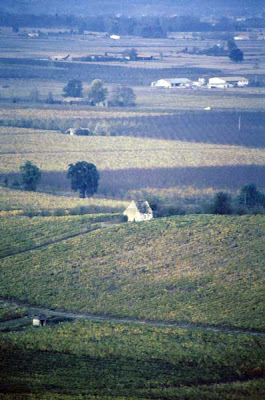 Vineyards in the Monbazillac appellation region. When we drove by, we noticed that there was a tasting room and it was open. We're not known to pass up a free sip of wine, so we stopped in. The woman in the room greeted us and poured samples, which we downed eagerly. We were surprised that the wine was sweet; I guess we were expecting a more traditional, drier white like a sauvignon blanc. When Ken remarked that the wine was sweet, I think he used the word sucré. In an almost surly tone, the woman corrected him. "C'est liquoreux, monsieur." We had been summarily put in our place. By the way, the Robert-Collins defines liquoreux as "syrupy, sweet and cloying." That it was, and good, too. But definitely not sucré. 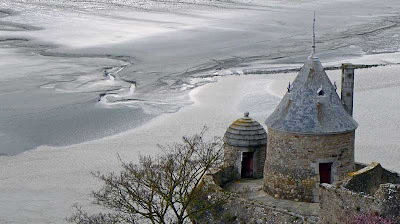 Another view from the château. We took a few photos around the château then headed down into the valley and our destination for the night : Bergerac. I suppose this week's word is obvious, since we have nearly the same word in English. Timorous, fearful or timid. Remember last week when I mentioned that the tv guide review of Starship Troopers 2 mentioned "lame thrills ?" Actually, the expression in French was "... le frisson reste timoré..."
A frisson is a shudder or a shiver. I translated that as "thrills" in the context of the movie description. And "the thrills are a bit timid" conveys the idea, but doesn't really mean much in English. So I went with "lame thrills." In other words, this movie was a lot less thrilling than it could have been. 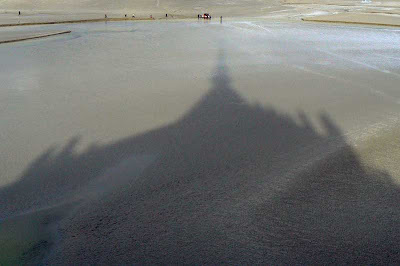 Image from www.amgmedia.com, Ernest von Rosen. I get the impression that a lot of people think a Kitchen Aid stand mixer is kind of a luxury item. Given its cost, you don't really think you'll use it enough to justify buying one. I know I felt this way for many years. But then I figured what the heck and bought one. It was a present for Ken, although I use it more than he does (yeah, one of those presents). That was nearly fifteen years ago and I've never regretted it. It comes in very handy for lots of things. First and foremost, it's the best egg-white beater ever. You just get 'em going and leave 'em till they're done. I like to make pizza, and the mixer with its dough hook is tops for kneading. Anyone who's hand-kneaded bread dough will know what a chore that can be. The mixer takes the hard work out of the process and makes it much easier to say, "I think I'll make pizza today !" It does a good job of kneading home-made pasta dough, too. Cake batters are a cinch in the mixer as well, especially thick ones like when I make zucchini bread. One year we got ourselves a grinder attachment that lets us grind meat and vegetables for a variety of recipes. I'm actually surprised at how often we use that. And it's not hard to clean up. The shiny stainless bowl washes up in no time, and the parts go right into the dishwasher. No fuss, no muss. I've read in other blogs that these mixers last forever. Like I said, ours is nearly 15 years old. Since it's an American model, we were worried that we wouldn't be able to use it here in France due to the power differences. But I wasn't willing to give it up and we brought it along. Luckily we found ourselves a sizable power transformer for the kitchen (via the internet) and we can run our imported Kitchen Aid, espresso machine, and food processor just fine. I'll bet there are a lot more uses for this appliance. What do you use it for ? We left Toulouse and drove up through Montauban and up to Cahors, where we stopped for lunch. I didn't take too many photos here because, in 1989, the center of town was all torn up. I think they were replacing utilities and updating the paving and all, and it was a mess. 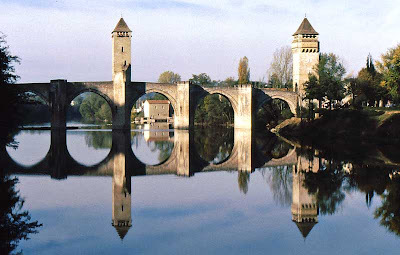 We wanted to go to Cahors not only for its famous 14th century bridge, the Pont Valentré, but also because of the famous "black" wine of legend that's made in the region. The auxerrois, or malbec, grape produces a hearty red wine here that got Cahors its A.O.C. designation in 1971. The city is in the Département du Lot in the valley of the river with the same name. The Lot river runs around the city in a huge loop. According to its web site, Cahors is home to 20,000 Cadurciens. It was founded at the site of a spring that the Gauls then the Romans venerated, and it still provides water to the city today. 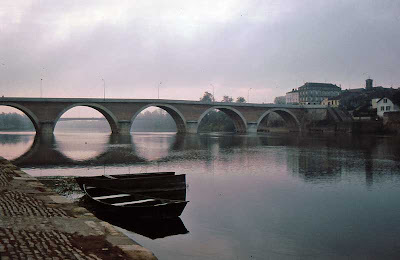 The legendary Pont Valentré spans the Lot river at Cahors. We drove into town across the Pont Valentré, something that I think is no longer possible. Our friend Sue went to Cahors last year and said that cars are no longer allowed on the bridge. When the bridge was under construction in the 1300's, legend has it that it was taking so long that the architect made a pact with the devil to make materials available. Apparently the devil held up his end of the bargain and the bridge quickly neared completion. Not wanting to abandon his soul to Satan, the architect challenged the devil to bring him water in a colander, which he could not do. At that point, the devil cursed the middle tower of the bridge so that it could never be finished, and each time the men tried to complete it, it collapsed. I think this is near the town of Fumel on the Lot, west of Cahors. During a 19th century restoration, the architect in charge had a stone carved in the shape of the devil with his fingers caught between the stones as if he were trying to pull them apart. That stone was placed on the middle tower and it has stood intact since. Quite a little legend, eh ? An older concrete borne alongside the road. These days, they're made of plastic. I think the concrete ones did too much damage to cars that strayed off the road. We left Cahors after lunch and headed down the Lot river valley toward the west. I remember the twisty roads and some nice scenery. We turned north again just south of Bergerac and made that our destination for dinner and the night. 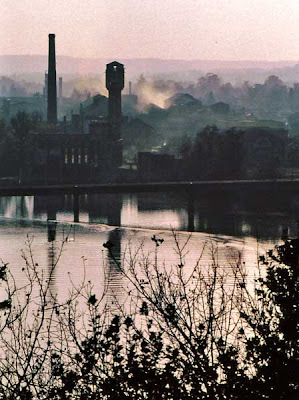 We went back to Cahors in 1995, but I'll leave that story for another time. I'll state from the beginning that I will not do this city justice. We didn't really spend much time there, just a bit of a walk around one morning. Then we continued on our way. 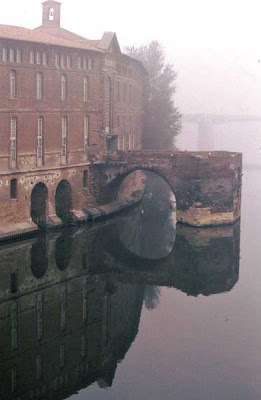 Fog over the Garonne river in central Toulouse. The fog was still in the process of lifting out of the Garonne river valley when we got there and it gave the city an other-worldly feeling. 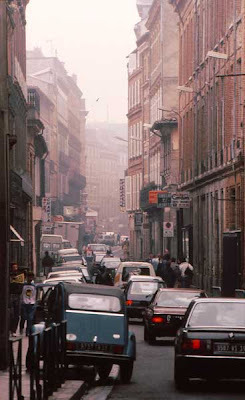 Toulouse is France's fourth largest city, home to over 400,000 Toulousains. The metropolitan area contains almost a million people. The morning rush hour winds down. 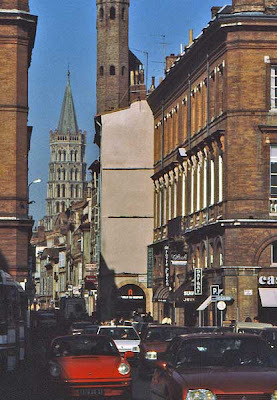 The city is known as la ville rose because its buildings, at least in the central part of town, are constructed mostly of red bricks made from the river valley's clay soils. Toulouse is a city that I would like to know better. It's the home of Airbus Industrie (now Airbus S.A.S), the aircraft manufacturer. According to Wikipedia, about half the world's commercial airline fleet is made by Airbus. I'm not sure which church this is... it may be St.-Sernin. 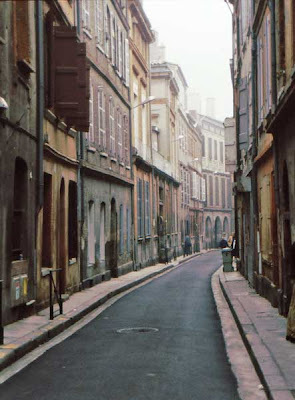 Toulouse is also where the late Claude Nougaro grew up. Nougaro was a successful singer/songwriter from the 1960s until his death in 2004. His songs, among them Le Jazz et le Java, Tu Verras, and of course, Toulouse, are standards of French pop music. 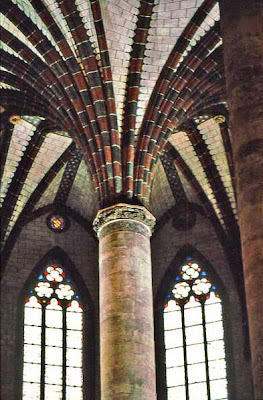 The tower of the Basilique St.-Sernin (above and below) is quite a landmark in central Toulouse. The city has a long and rich history that I won't attempt to summarize here. We wandered around the small streets in the center of town, saw the Place du Capitole and the Basilique St.-Sernin. By the time we were ready to leave, the sun had come out and turned the buildings' pink tones to deep red. 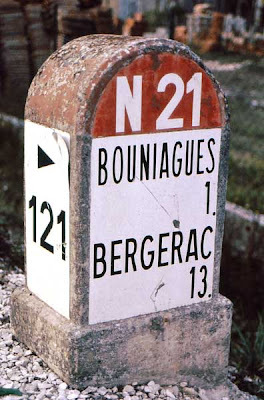 From Toulouse we headed north toward Cahors and on to Bergerac for the night. Our evening in Castelnaudary was capped off by dinner in our hotel's restaurant. The specialty was, of course, cassoulet, that hearty, yummy stew made with white beans and duck and such. Castelnaudary claims to be the true home of cassoulet, named for the terre cuite cassole that it's traditionally cooked in. According to the legend, it was during the 100 years war that the residents of Castelnaudary came up with a single-pot recipe of hearty food to reinforce its soldiers. The cities of Toulouse and Carcassone also claim to be the true home of cassoulet and each recipe varies a bit. A little rivalry helps the legend along, I suppose. 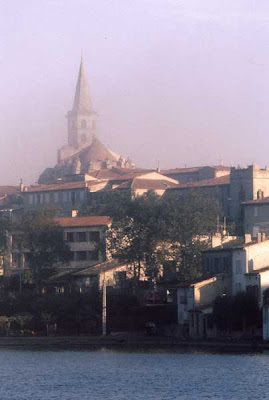 The fog burns off a Castelnaudary morning. There might have been a couple other folks in the restaurant, if memory serves. It was certainly not full, but it was a nice room and the staff were very welcoming. We ordered the cassoulet de Castelnaudary and the waiter recommended a local wine from Fitou. We told him we were in his hands. Fitou is an appellation in the southern part of the Corbières area and it was quite tasty. 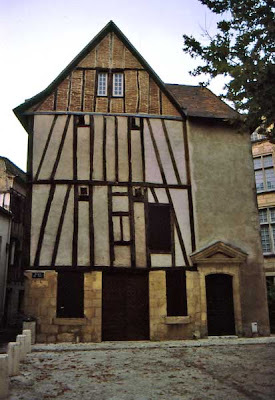 The 13th century collegiale (church) of Saint-Michel rises above town. The cassoulet was everything it promised to be. Succulent, full of flavor. Saucisses de Toulouse, a duck leg that just melted in your mouth, tender white beans. We don't have any photos, just memories; this was in the days before digital cameras. Le Grand Bassin at Castelnaudary. The waiter noticed that we were really enjoying ourselves - c'était un vrai régal - and seemed real happy about it. He brought us two armagnacs after dinner and offered them to us on the house ! A perfect ending. And all we had to do after was climb upstairs and fall into bed. Another view of the Grand Bassin as the fog burns off. The next morning was quite foggy, but just before we checked out of the hotel the sun started to burn the fog away. We walked around to capture a few images before heading on to Toulouse. We stopped for the night in Castelnaudary, which I reckon is another way of saying Châteauneuf du roy, or King's Newcastle. So there you go. Today there are about 11,000 Chauriens* living there. Whatever its linguistic origins, Castelnaudary is known for its cassoulet, a stew of white beans or lingots, duck confit, pork, lamb, and sausages. This is why we stopped here. 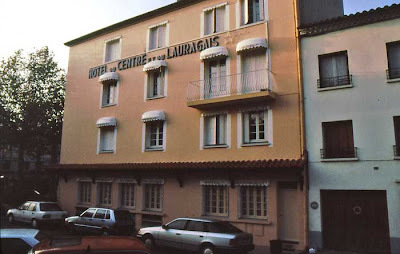 Our hotel, l'Hôtel du Centre et du Lauragais. The restaurant is on the ground floor and our room is the window directly beneath the "et du" of the sign. Evening was upon us when we arrived and we quickly found a hotel in the center of town. The main square across from the hotel was host to a carnival midway - this was the week of la Toussaint, or All Saint's Day, in France : November 1. Cities and villages all over France set up carnivals this time of year; it's a national holiday and schools are out for a week. We checked into our hotel and took a little walk while the sun went down. The view from our room onto the square. 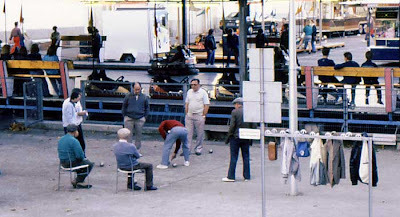 You can see the bumper cars just behind the guys playing boules. The Canal du Midi goes right through Castelnaudary. At one end of town it widens out into a basin that stores water to operate the four locks on the eastern side. The Grand Bassin at sunset. The hotel room was nice, overlooking the carnival square, but it had one peculiarity that I'll never forget : the bathroom's toilet. Inside the bowl, at the bottom, was a rubber gasket that looked strangely like the splash guard of a kitchen sink garbage disposal unit. I didn't figure it out until after I flushed, at which point a little grinder in the base of the toilet went to work, not at all unlike the aforementioned kitchen garbage disposal unit. This was necessary because the older waste pipes in the building were not large enough to handle (ahem) solid waste unless it was chopped into more manageable bits. I'll wait until tomorrow's post to describe our dinner that evening. * Throughout these posts I'm trying to include the name for the inhabitants of each of the towns and cities that I mention. Every town and city in France has an official name for its inhabitants. Funny, but I still don't know the name for the citizens of the town I live in. I'll have to work on that. This post is not really about wine, but I'm sipping some while I type and that should count for something. Fall vineyards in either Corbières or Minervois - I don't remember which. When Ken and I left Sète we headed toward Béziers, then through Narbonne and Carcassonne. We were roughly following the course of the Aude and the Canal du Midi, and thus, the border between two well known A.O.C. 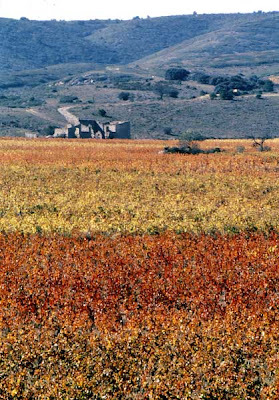 's in the Languedoc-Roussillon wine region : Corbières and Minervois. 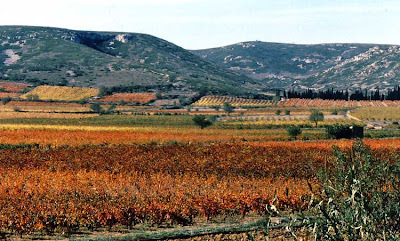 The low mountains reflected shades of muted green and purple and the vineyards shone in bold oranges and yellows. We found a shady spot on the canal to have a picnic lunch - it was much warmer here than it had been on the coast. 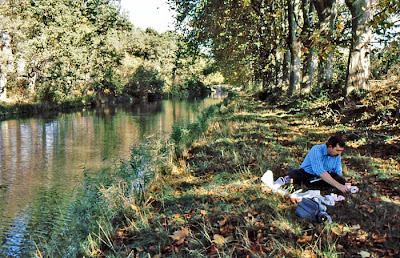 Ken sets up our picnic lunch next to the Canal du Midi while I wander around with the camera. Check out the dark hair ! We did picnic lunches a lot on this and subsequent road trips through France. It's much more economical than going to restaurants all the time, and it can save time, too. Besides, part of our sightseeing took us to many outdoor markets where we could buy something to build a lunch around. Most of the time we had pâté or rillettes of some kind, cheese, a salad like carrottes rapées or concombres, and fruit or pastry for dessert. Always with a baguette and a bottle of wine. You know by now that I like to watch. Television, that is. Within six months of moving to France we had a satellite dish installed on the house and had it connected to two sets. Then, through trial and error, we found out which tv magazine gave us the best listings for our programming package and eventually subscribed to it. Now, it may not be the best way to learn new things, but I must say that watching French programs* (news, talk shows, documentaries, movies, and even commercials) is not the worst way to pick up on how the language is used and, of course, to add to your vocabulary. In fact, out here in the countryside, it's a darned good way. So is reading the tv guide; all the program descriptions are in French, naturally. So this week I noticed a movie in the listings called Starship Troopers 2. Having mildly enjoyed the original, I was curious, until I read the guide's review : "S'évertuer à prolonger un succès paraît ici bien vain..." Striving to build on the success [of the original movie] seems in this case quite futile... It goes on to talk about miserable special effects and lame thrills (more words for later). You get the picture. S'évertuer means to strive, to do one's utmost, to struggle toward a goal. I didn't have to m'évertuer to choose something else to watch that night. While we're on the subject of tv, France 2 is running a series of short films based on the contes (tales) of Guy de Maupassant on Tuesday nights. We missed the first two last week (Eddy Mitchell was in one! ), but did see last night's episode. The first movie was Le Père Amable, full of Norman patois, but not too hard to decipher. The second film, Hautot Père et Fils, starred Jean Rochefort and his son Julien. We enjoyed them both. *Full disclosure moment : Ken and I do watch programming in English - mostly movies, some series, and some political news shows. Digital satellite tv allows us to choose the language we hear for many programs. I maintain that there's no reason to watch an American movie dubbed into French, except for the pure entertainment value of the lousy translations. Over the years I've developed a taste for cognac, calvados, armagnac, poire, and several other eaux de vie, not to mention port. To be honest, my taste developed rather quickly. Like after the first sip. I don't drink these cordials much because I have no will power. Once that bottle is open, it only takes a few days to empty it, and man, the hard stuff messes with your head. As in pain the next morning. But I still love it. We have some tiny snifters, but they're not really big enough to do the proper job that a snifter is supposed to do. We also acquired two sets of what are essentially thick, heavy shot glasses that we both like. 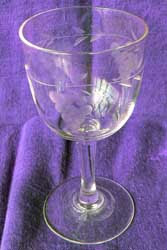 But somewhere along the way Ken found a few older, etched, stemmed cordial glasses in a second-hand store. Each little glass is different from the others, but they all kind of go together. And they make a nice change from the snifter or the shot glass. Year Of The Bug ? We've had an unusually warm winter this year. Looking back at my records (yup, I keep records), I count only ten days since the winter solstice when the temperature dipped below freezing. And those were the lows; the highs stayed below freezing only one day, back in December. People around here say that this winter has been too warm. More specifically, that there wasn't enough cold weather to kill the bugs. We're going to have way too many bugs this summer, just you wait and see, they say. I have heard this once before, but at the time I hadn't really been here long enough to see any difference in the bug population. A visitor peers into the guest room window . Now we're heading into our fifth summer in the Loire Valley. 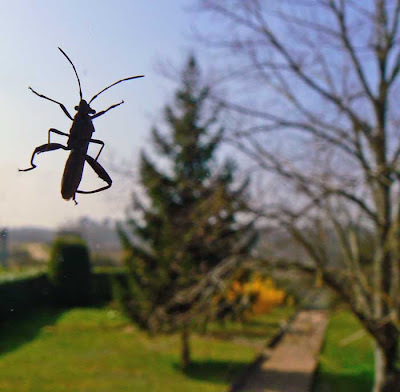 It's only March, but already I can tell that there are lots of bugs flying around out there. The bats are already out and active at twilight. The bees are buzzing methodically around the flowering trees, which, by our reckoning, have flowered about 2 weeks earlier than last year. So what does this mean for us ? Lots of flying things in the house this summer. Maybe a more devastating attack on our vegetable garden. More moles than usual. But maybe there'll be more insect-eating birds around, too. You know, high population of food equals higher population of whatever eats it. Old wives' tale, or have I watched too many nature shows on tv ? We shall see. Whatever happens, I know it won't be cold enough on the ground to make a serious dent in the population of creepy-crawlies. I'll keep you posted. Tomorrow : Kitchen Collection #14. We left Aigues-Mortes and continued west and south along the coast, driving past Montpellier on the way to Sète. The sun was going down fast so we looked for a cheap and easy motel and found one without much trouble. Over 40,000 Sètois call this city home. Sète is a port town and was apparently a pretty busy one. I don't know much about its current activity, though. 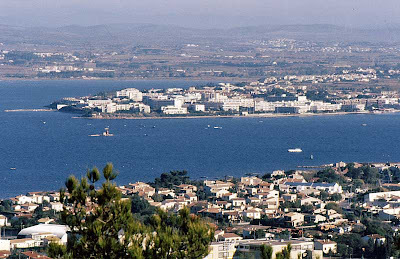 Great views around Sète can be had from the Mont Saint-Clair . There are two very famous sons of Sète : Paul Valéry (1871-1945) was a writer and poet, and a member of the Académie Française. Georges Brassens (1921-1981) was a beloved poet, folk singer and songwriter whose works have become standards of French popular music. 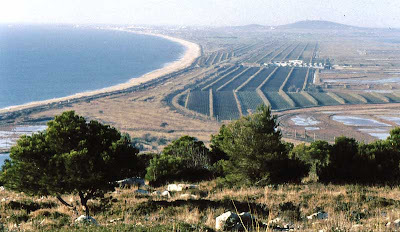 View looking southwest along the Mediterranean coast. I don't have any real vivid memories of the town itself; it was just an overnight stop for us. We did some quick sightseeing the next morning before heading inland and westward. 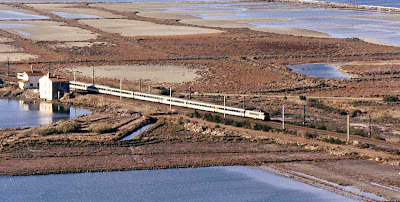 A train makes its way across the marshes and what I think are salt ponds toward Sète. We left Arles after lunch and headed south. We'd end up spending our next night in a place called Sète on the coast. But first, we had a few more sights to see. We drove down through the Camargue to Saintes-Maries-de-la-Mer. We got out of the car at the beach for a quick walk. Quick, because it was October and the wind was blowing and it was not warm. But the sea was pretty. 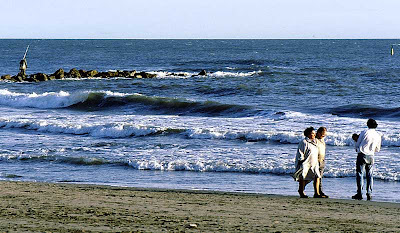 People walking along the beach at Saintes-Maries-de-la-Mer. We didn't stay long enough to see much of the town or visit its famous church where the three Saint Marys (Magdalene, Jacobe, and Salome) are supposedly entombed. Not being Catholics, we really aren't very knowledgeable about all that stuff. About 2,500 santois live in the town year round these days. That population swells considerably during the summer. After our beach walk, we headed to Aigues-Mortes to see the famous walled town named for "dead waters." 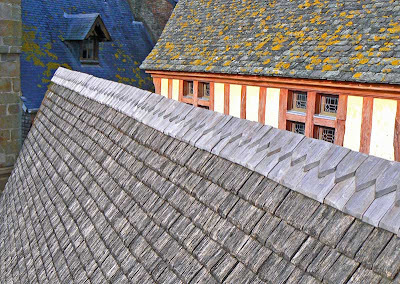 In the 13th century, Louis IX (Saint Louis) built this town as a jumping-off point for his crusade. Again, this was a quick stop for us. There was a festival of some kind going on inside the walled town and we didn't take the time to mingle with the crowds. Cars parked outside the walls of Aigues-Mortes. I did notice a bunch of cars parked in a field outside the ramparts. It struck me as funny for some reason, like it was Disneyland or something other than a real place. As shadows lengthen, groups of kids are out on the mud flats. 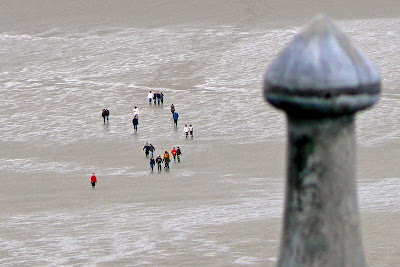 As Ken has mentioned in his blog, lots of people venture out onto the mud around the Mont-Saint-Michel. They don't go far without a guide because there are spots where the mud is actually quicksand, and you can get into big trouble. 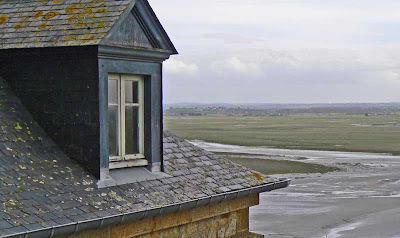 Rubber boots are de rigueur on the tidal flats around the Mont-Saint-Michel. During our visit, two young girls got stuck up to their thighs in quicksand (above - click on the picture to see a larger version). It took a couple adults about 15 minutes to dig them out while the other members of their group looked on. I wonder how often that happens ? Makes you realize that you don't want to be out there alone. 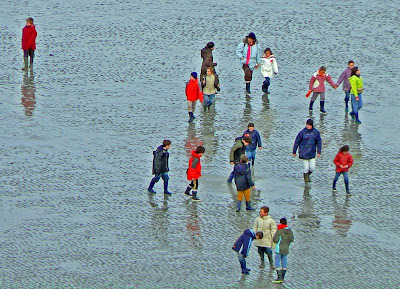 Random patterns of people dot the expanse of mud and water. 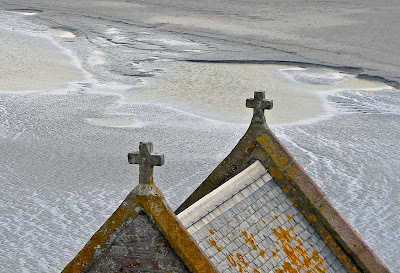 That's the last of my entries for the Mont-Saint-Michel for a while. I hope you enjoyed them ! And you thought we were done with the Mont ! All in good time... There's something about the contrast between the regularity of the building shapes and the organic patterns in the mud and water that keeps us snapping pictures. Then, there is the variety of buildings and materials. They are each built to keep out wind and moisture, and they each respond to the environment differently. I often felt like I wanted keys to every building in the place so I could climb up and peer out the windows that point in every direction. After a while, though, you just want to sit down and have a glass of wine. That gets you ready for your next climb around ! I think I'll be done with the MSM after one more post. Then we'll head back down to southern France for a while. This is a verb that, if you don't know it, can easily be figured out from context, if not from its latin root and similarity to the English counterpart of the noun form. My encounter with echelonner is from the tv weather people. Specifically, Laurent Romejko on France 2. I'll often hear him say that "les températures demain s'échelonneront de onze à vingt-deux degrés." 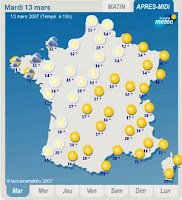 He means that the temperatures will be evenly distributed between eleven and twenty-two degrees accross the country. The word is the verb form of echelon, which comes from echelle, which itself derives from the latin scala, meaning ladder. So echelonner means to space out (not that way) or distribute at regular intervals. 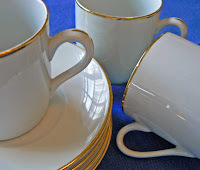 Demitasse cups are among those little luxuries that you allow yourself from time to time. I remember one year, more than twenty years ago, when Ken and I were celebrating one of our first Christmases together. We had been back from France for a couple of years by then. We got ourselves one of those Italian espresso pots but didn't have the little cups to make ourselves feel like we were sipping our coffee in a French café. We each somehow got the idea to surprise the other with a set of four demitasse cups. Quite a surprise ! They're almost identical, the two sets, except the ones he got for me (pictured here) are rimmed with gold. The cups I gave him are a bit heftier and have black rims. We've used them ever since, only now we have a fancy espresso machine (another gift) that makes pretty authentic stuff. Oh, we still have the Italian pot - two to be exact. Maybe they'll be featured here one day.